Mikhail Sergeyevich Gorbachev (born 2 Mairch 1931) wis a Soviet leader. He wis the aicht leader of the Soviet Union, haein been General Secretary of the Communist Party of the Soviet Union frae 1985 until 1991. He wis the kintra's heid of state frae 1988 until 1991 (titled as Chairman of the Presidium of the Supreme Soviet frae 1988 to 1989, as Chairman of the Supreme Soviet frae 1989 to 1990, an as President of the Soviet Union frae 1990 to 1991). 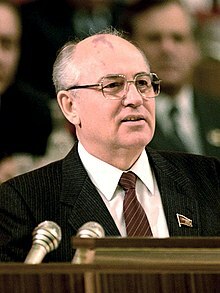 Gorbachev wis born in Stavropol Krai intae a peasant Ukrainian–Roushie faimily, an in his teens, operated combine harvesters on collective farms. He graduated frae Moscow State University in 1955 wi a degree in law. While he wis at the varsity, he joined the Communist Party, an suin became very active within it. In 1970, he wis appyntit the First Party Secretary of the Stavropol Regional Committee, First Secretary tae the Supreme Soviet in 1974, an appyntit a member of the Politburo in 1979. Within three years of the daith of Soviet leader Leonid Brezhnev, follaein the brief "interregna" of Andropov an Chernenko, Gorbachev wis elected general secretary bi the Politburo in 1985. Afore he reached the post, he haed occasionally been mentioned in Western newspapers as a likely next leader an a man of the younger generation at the tap level. Gorbachev's policies of glasnost ("openness") an perestroika ("restructuring") an his reorientation of Soviet strategic aims contreibutit tae the end of the Cold War. Unner this program, the role of the Communist Party in governing the state wis removed frae the constitution, which inadvertently led to crisis-level poleetical instability wi a surge of regional nationalist an anti-communist activism culminatin in the dissolution of the Soviet Union. Gorbachev later expressed regret for his failure to save the USSR, tho he haes insisted that his policies war nae failures but rather war vitally necessary reforms which war sabotaged an exploited bi opportunists. He wis awairdit the Otto Hahn Peace Medal in 1989, the Nobel Peace Prize in 1990 an the Harvey Prize in 1992, as well as honorary doctorates frae various varsities. In September 2008, Gorbachev an business oligarch Alexander Lebedev annoonced thay wad form the Independent Democratic Party of Russia, an in Mey 2009 Gorbachev annoonced that the launch wis imminent. This wis Gorbachev's third attempt to establish a poleetical party, haein stairtit the Social Democratic Party of Russia in 2001 an the Union of Social Democrats in 2007. ↑ "Mikhail Gorbachev will found new political party". mosnews.com. 13 May 2009. Archived frae the oreeginal on 16 July 2011. Retrieved 13 June 2009. This page wis last eeditit on 10 Mey 2018, at 01:54.